Students working in small groups during the talent development session at National Assembly. Photo courtesy of Bethany Corne. On her first day on the job at an agency, Bonnie Upright took her future into her own hands—literally. Her boss Del Galloway, APR, former PRSA chair, placed a PRSA membership packet into her hands and told her that she should join. Now, sixteen years later, Upright is a member of the PRSA Board of Director, PRSA Board Liaison for the PRSSA National Committee, and APR accredited. Upright’s talent got her to the top, but it was Galloway’s encouragement that enabled her to start her leadership journey. 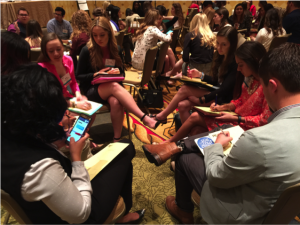 Just like Galloway inspired Upright to reach her full potential, it is the responsibility of older PRSSA members to recognize the talents and potential in their Chapter’s younger members. Older students should look for those young superstars who display the characteristics of an effective public relations professional—ambition, enthusiasm, sincerity and willingness to participate. Then they should take that student under their wing and guide them to success. The best way for younger students to grow as leaders is to surround themselves with the right people. You should never be the smartest person in the room, Upright said. This is where experienced older students can play a role. All upperclassmen should take the initiative to mentor their younger peers. Older students should recognize younger students’ talents, help them build their skills and ultimately be their best resource. Acting as a mentor will encourage these students to reach their full potential and become future leaders in the field. Older students should recognize the potential and talent in younger students. Mentorship is a great way to encourage a young student to reach their full potential as a leader. Surround yourself with people from whom you can learn in order to develop your leadership skills. Encouragement, praise and recognition of talent go a long way to promote confidence in future leaders. Bethany Corne is a sophomore majoring in public relations and marketing at The University of Alabama. She is the publications committee leader for UA PRSSA and a digital strategist for the Capstone Agency. Follow her on Twitter @BethanyyyC14, find her on LinkedIn or email her at bcorne@crimson.ua.edu.